IL-8, a member of the chemokine family, has been shown to play an important role in tumor growth, angiogenesis, and metastasis. The objective of this study was to determine the mechanism of IL-8-mediated angiogenesis. We examined the direct role of IL-8 in angiogenesis by examining IL-8 receptor expression on endothelial cells and their proliferation, survival, and matrix metalloproteinases (MMPs) production. We demonstrate that HUVEC and human dermal microvascular endothelial cells constitutively express CXCR1 and CXCR2 mRNA and protein. Recombinant human IL-8 induced endothelial cell proliferation and capillary tube organization while neutralization of IL-8 by anti-IL-8 Ab blocks IL-8-mediated capillary tube organization. Incubation of endothelial cells with IL-8 inhibited endothelial cell apoptosis and enhanced antiapoptotic gene expression. Endothelial cells incubated with IL-8 had higher levels of Bcl-xL:Bcl-xS and Bcl-2:Bax ratios. Furthermore, incubation of endothelial cells with IL-8 up-regulated MMP-2 and MMP-9 production and mRNA expression. Our data suggest that IL-8 directly enhanced endothelial cell proliferation, survival, and MMP expression in CXCR1- and CXCR2-expressing endothelial cells and regulated angiogenesis. Acrucial step in tumor growth and metastasis is tumor neovascularization (1, 2). Tumor angiogenesis is regulated by aberrant production of angiogenic and antiangiogenic factors expressed by malignant tumor cells, host cells, or both (3, 4). A member of the CXC chemokine family, IL-8, also known as CXCL-8, has been shown to regulate pathological angiogenesis, tumor growth, and metastasis (5, 6, 7, 8). The receptors for IL-8, CXCR1 and CXCR2, are widely expressed on normal and various tumor cells (9, 10, 11, 12) and bind IL-8 with high affinity (13, 14, 15, 16). The mechanism(s) regulating IL-8-mediated angiogenesis is not well understood. Angiogenesis is a multistep process including endothelial cell proliferation and migration by degradation of the extracellular matrix by matrix metalloproteinases (MMPs)3 (17) and capillary tube formation which is mediated by various angiogenic factors such as vascular endothelial growth factor, basic fibroblast growth factor, and IL-8 (18). Recent reports suggest that in addition to cell proliferation and migration, endothelial cell survival and death are also important components for tumor angiogenesis (19). Recent studies have shown that a cell cycle-regulated apoptosis inhibitor, survivin (20, 21), and the cell death-related gene family, Bcl-2 (22), are associated with vascular endothelial growth factor-induced angiogenesis (23, 24, 25). IL-8 and its receptors, CXCR1 and CXCR2, have been observed on endothelial cells (7, 8) and have been shown to play a role in endothelial cell proliferation (5). However, these findings remain controversial and a direct role of IL-8 in angiogenesis is not well established. In the present study, we provide evidences to support the direct role of IL-8 in angiogenesis by enhancing proliferation and survival and inhibiting apoptosis of CXCR1- and CXCR2-expressing endothelial cells. Furthermore, treatment of endothelial cells with IL-8 significantly enhanced production of MMPs and capillary tube organization. HUVEC and dermal microvascular endothelial cells (HMEC) were obtained from American Type Culture Collection (ATCC, Manassas, VA) and (Cambrex Biosciences, Walkersville, MD). These cell lines were maintained in culture as an adherent monolayer in endothelial cell medium supplemented with 10% FBS and endothelial cell growth supplement (EGM-2 MV; Cambrex Biosciences). Recombinant human IL-8, growth-regulated oncogene α (gro-α, also known as CXCL-1) and anti-IL-8 Abs were purchased from R&D Systems (Minneapolis, MN). Endothelial cells were seeded into 6-well (cell counting) and 96-well ([3H]thymidine incorporation) flat-bottom plates in duplicate or triplicate and allowed to adhere overnight. The cultures were then washed and refed with medium alone (control) or medium containing different concentrations of recombinant human IL-8. Following 96 h of incubation, cell proliferation was determined by cell counting and [3H]thymidine incorporation. For [3H]thymidine incorporation, cultures were pulse labeled with [3H]thymidine (1 μCi/well) and washed, and radioactivity was measured using a beta counter. For cell counting, cells were trypsinized and viable cells were counted using a hemocytometer. Percent growth stimulation was calculated as growth stimulation = (A/B) −1 × 100, where A is the number of viable cells in treated cultures and B is the number of viable cells in untreated control cultures. To determine whether IL-8 treatment inhibited apoptosis and enhanced survival, endothelial cells (1 × 105 cells/well) in four-well chambered slides were incubated with medium alone or medium containing 1 or 10 ng/ml IL-8. Following 72 h in culture, cells were stained with a CaspACE FITC-valylalanylaspartyl [O-methyl]fluoromethoxyketoneVAD-fmk in situ marker kit (Promega, Madison, WI) according to the manufacturer’s protocol. The number of apoptotic cells was determined by counting the average numbers of immunostained cells in five independent high-power fields (×200), each containing 50–100 cells using a Nikon fluorescence microscope (Nikon, Melville, NY). An in vitro capillary tube formation assay was performed as described earlier (26). Briefly, 5 × 104 HUVEC were plated on a Matrigel (BD Biosciences, Mountain View, CA)-coated 24-well plate with medium alone or medium containing IL-8, fibroblast growth factor 2 (FGF-2), or neutralizing Ab to IL-8. Following 6 h of incubation, the plate was examined for capillary tube formation under an inverted microscope and photographed. Each assay was done in duplicate and each experiment was repeated three times. The qualitative difference in tube formation was examined in treated or untreated cultures. Culture supernatants from 5 × 105 endothelial cells were used for gelatin zymography as described previously (27). Briefly, the gelatin-degrading activity in the culture supernatants was analyzed by electrophoresis on an 8% SDS-PAGE-containing gelatin (1.5 mg/ml) without prior heating or reduction. Following electrophoresis, the gel was washed in 2.5% Triton X-100 to remove SDS, incubated in 50 mM Tris-HCl buffer (pH 7.5), containing 0.15 M NaCl, 10 mM CaCl2, and 0.02% (w/v) NaN3 with or without EDTA for 16 h at 37°C and stained with 0.1% Coomassie brilliant blue R250 (Sigma-Aldrich, St. Louis, MO). Gelatinolytic activity was visualized by negative staining. Prestained SDS-PAGE protein standards (Bio-Rad, Richmond, VA) were used for estimating molecular mass. Endothelial cell migration in response to IL-8 was determined as described earlier (28, 29). Transwell chambers (6.5 mm) (Corning Costar, Cambridge, MA) with polycarbonate membrane containing 8.0-μm pores were coated with matrigel. Endothelial cells (5 × 104) were plated onto transwell chambers with medium (serum free) alone or medium containing different concentrations of IL-8 in duplicate and incubated at 37°C in CO2 for 4 h. MTT was added and cells were incubated for an additional 2 h. Cells from the top of the Transwell chambers were removed using a cotton swab (residual cells). Cotton swabs containing residual cells and transwell chamber (migrated) cells were placed in 24-well plates containing 400 μl of DMSO. Following 1 h of gentle shaking, 100-μl samples were removed and absorbency was determined at 570 nm using an ELISA plate reader. The percent migratory activity was calculated as: percent migration = A/[(A + B] × 100, where A is the absorbance of migrated cells and B is the absorbance of residual cells. CXCR1 and CXCR2 protein expression in HUVEC and HMEC was analyzed by ICC. Briefly, cells (1 × 105) were plated in four-well chambered slides. The cells were cultured for 72 h and used for immunostaining. Samples were washed twice with PBS and fixed with 4% glutaraldehyde (Sigma-Aldrich) in PBS for 10 min. After washing twice with PBS, cells were incubated with a blocking solution containing 5% normal horse serum in PBS for 20 min at room temperature. Excess blocking solution was drained and samples were incubated with a 1/200 dilution of anti-CXCR1 or anti-CXCR2 Ab or isotype control Ab (BD PharMingen, San Diego, CA) overnight at 4°C in a humidified chamber. The samples were then rinsed four times with PBS and incubated with a 1/500 dilution of biotinylated horse anti-mouse/rabbit IgG (Vector Laboratories, Burlingame, CA). The ICC reaction was detected using the avidin-biotin complex Elite and diaminobenzidine substrate kits (Vector Laboratories) according to the manufacturer’s instructions. A reddish brown precipitate in the cytoplasm indicated a positive reaction. Negative controls used all reagents except the primary Ab. Endothelial cells were allowed to adhere overnight, washed, and refed with HBSS containing 125I-IL-8 at different concentrations alone or in combination with 100-fold molar excess IL-8 or gro-α in the binding buffer (HEPES buffer containing 0.1% BSA). The reactions were carried out at room temperature for 1 h, the cells were washed extensively with binding buffer and lysed in 0.1 N NaOH, and cell-associated radioactivity was measured in a gamma counter. Nonspecific binding was determined using a 100-fold excess of unlabeled ligand. Data were analyzed by the Scatchard method using Graph Prism software (GrapPad, San Diego, CA) and presented as specific binding. Cell surface expression of CXCR1 and CXCR2 on HUVEC was analyzed by flow cytometry using PE- and FITC-labeled anti-CXCR1 and CXCR2 Ab (BD PharMingen). We performed dual staining to obtain the information regarding the expression of both receptors on the specific cell population. Data were acquired on a BD Biosciences (San Jose, CA) FACStarPlus and analyzed by using the Attractors and CellQuest software. Total cellular RNA was isolated from endothelial cells (1 × 106 cells) using TRIZOL reagent (Life Technologies, Gaithersburg, MD). RT-PCR was performed as described earlier (30). Briefly, cDNA was synthesized using total RNA (2 μg), oligo(dT)12–18 primer, and superscript RT (Life Technologies). Two microtiters of first-strand cDNA (1/10 dilutions) was amplified using PCR primer sets (Table I⇓). The primers were synthesized by Sigma-Genosys (Woodlands, TX). Each cycle set used a denaturing temperature (94°C) for 60 s, annealing temperature (55°C) for 90 s, and extension temperature (72°C) for 90 s for a total of 30 cycles for each primer, except GAPDH where it was 20 cycles. PCR fragments were separated on a 2% agarose gel containing ethidium bromide (0.5 μg/ml), visualized, and photographed using an Alpha Imager Gel Documentation System (Alpha Innotech, San Leanardo, CA). Semiquantitative mRNA analysis was performed using an equal number of cells with simultaneous amplification in the linear range. Relative intensity of the specific gene expression was determined with Alpha Ease (Alpha Innotech). mRNA expression was presented as expression index, the ratio of each signal to the signal from the housekeeping gene GAPDH. The expression index for cells cultured with medium alone was arbitrarily set to 1 to represent the difference in the expression level among HUVEC treated with different concentrations of IL-8. Cell extracts from treated and untreated HUVEC were quantitated by a bicinchoninic acid protein assay kit (Pierce, Rockford, IL). Equal amounts of proteins (20 μg/lane) were separated on SDS-PAGE and electrotransferred to 0.45-μm nitrocellulose membranes. The membranes were blocked with 3% BSA and probed with anti-bcl-2 (1:100) and bax (1:200), followed by biotinylated anti-IgG and alkaline phosphatase-streptavidin (Vector Laboratories). Protein bands were visualized by an enhanced chemifluorescence detection system according to the manufacturer’s protocol and analyzed using a PhosphorImager and ImageQuant software (Molecular Dynamics, Sunnyvale, CA). Relative intensity of the specific protein expression was determined using ImageQuant 5.1 (Molecular Dynamics). The significance of the data was determined by Student’s t test (two-tailed) using SPSS software (SPSS, Chicago, IL). A value of p < 0.05 was deemed significant. Expression of CXCR1 and CXCR2 on endothelial cells and their role in angiogenesis remains controversial. Therefore, in the first experiment, we determined whether HUVEC and HMEC express CXCR1 and CXCR2 by ICC, flow cytometry, and RT-PCR analysis. HUVEC and HMEC were fixed and immunostained with anti-CXCR1 or anti-CXCR2 Ab. Strong positive immunostaining was observed with CXCR1 and CXCR2 Abs in HUVEC and HMEC (Fig. 1⇓A, a–d). We did not observe immunostaining in cells incubated with control isotype Ab (Fig. 1⇓A, e and f). CXCR1 and CXCR2 mRNA expression was analyzed by semiquantitative RT-PCR mRNA analysis. We observed constitutive expression of CXCR1- and CXCR2-specific mRNA expression in HUVEC and HMEC (Fig. 1⇓B). We confirmed these observation by flow cytometry. We observed cell surface expression of both CXCR1 and CXCR2 expression in HMEC (Fig. 1⇓C). A, CXCR1 and CXCR2 expression in endothelial cells. CXCR1 and CXCR2 protein levels in HUVEC and HMEC were detected by immunocytochemistry. a, CXCR1 expression in HUVEC (ATCC); b, CXCR2 expression in HUVEC (ATCC); c, CXCR1 expression in HMEC; d, CXCR2 expression in HMEC; e, HUVEC cells stained with isotype control Ab; f, HMEC cells immunostained with isotype control Ab. B, CXCR1 and CXCR2 mRNA expression was determined by RT-PCR. Agarose gel photograph demonstrates the CXCR1 and CXCR2 mRNA expression. C, Flow cytometric analysis of CXCR1 and CXCR2 expression HUVEC. D, Radioligand-binding experiments using 125I-IL-8. Binding of 125I-IL-8 to HUVEC in the presence and absence of 100-fold excess unlabeled IL-8 or gro-α was examined. The values are 125I-IL-8 binding measured as cpm ± SD in the presence and absence of IL-8 and gro-α. Furthermore, we performed radioligand-binding experiments using 125I-IL-8. Binding of 125I-IL-8 to HUVEC cells in the presence and absence of 100-fold excess unlabeled IL-8 or gro-α was examined. Results shown in Fig. 1⇑D demonstrate that IL-8 binds to its receptor on endothelial cells, which can be blocked with IL-8 and gro-α (Fig. 1⇑D). Interestingly, we observed that blocking of 125I-IL-8 binding to HUVEC was lower with gro-α (which binds to CXCR2) as compared to IL-8 (which binds to CXCR1 and CXCR2), suggesting that both receptors are expressed on HUVEC. These data demonstrate that CXCR1 and CXCR2 mRNA and proteins are constitutively expressed in endothelial cells. We examined the effect of IL-8 on HUVEC and HMEC proliferation. HUVEC or HMEC were treated for 96 h with medium alone or medium containing recombinant human IL-8 at different concentrations. Endothelial cell proliferation was determined by analyzing the number of viable cells and [3H]thymidine incorporation in treated and untreated cultures. Treatment of HUVEC with IL-8 significantly enhanced endothelial cell proliferation as compared with untreated cells (Fig. 2⇓A). Treatment of HMEC with IL-8 also enhanced endothelial cell proliferation (not significantly) as compared with untreated cells (Fig. 2⇓B). We did not observe significant differences in HUVEC and HMEC number in cultures treated with 10 and 100 ng/ml IL-8 (Fig. 2⇓, A and B). Effect of IL-8 on endothelial cell proliferation. HUVEC and HMEC (2 × 103 cells) per well in 96-well plates and (2 × 104 cells) for 6-well plates were incubated with medium alone or medium with different concentrations of recombinant human IL-8. After 96 h, growth stimulation was determined by cell counting and [3H]thymidine incorporation as described in Materials and Methods. The values are mean viable cell number ± SEM (bars) of triplicate culture. This is representative of three experiments. ∗, Significantly different from endothelial cells cultured in medium alone (p < 0.05). In the next set of experiments, we incubated HUVEC with different concentrations of IL-8 and [3H]thymidine incorporation was analyzed. Similar to the increase in cell number following IL-8 treatment, we observed a dramatic increase in [3H]thymidine incorporation in endothelial cells following incubation with different concentrations of IL-8 (Fig. 2⇑C). We observed a significant difference in [3H]thymidine incorporation in HUVEC treated with 10 ng/ml IL-8 as compared with 1 ng/ml IL-8. Here again, we did not observe significant differences in [3H]thymidine in HUVEC treated with 10 ng/ml IL-8 and 100 ng/ml IL-8. 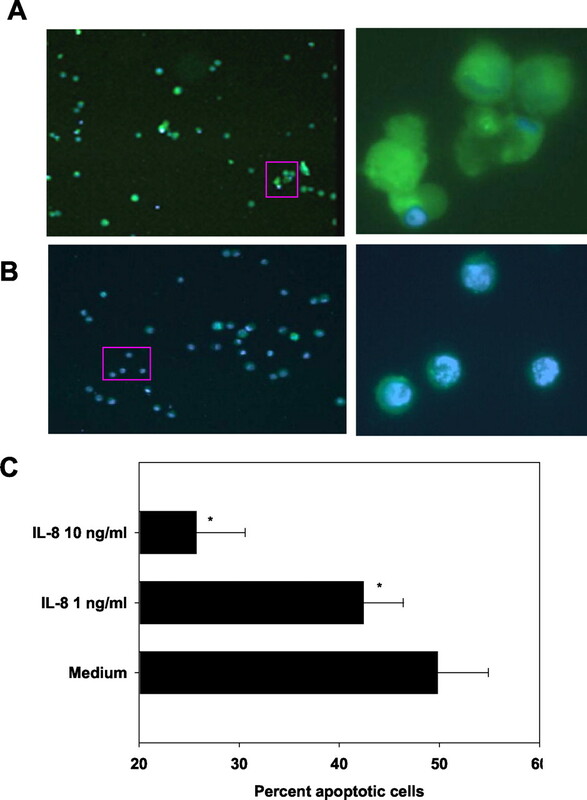 These data suggest that the exogenous addition of IL-8 induces endothelial cell proliferation, which was dependent on the concentrations of IL-8 used. We determined whether IL-8 treatment of HUVEC and HMEC inhibited apoptosis and enhanced their survival. Endothelial cells cultured in four-well chambered slides were treated with medium alone or medium containing 1 or 10 ng/ml IL-8 for 72 h. Cells were immunostained for apoptosis using the CaspACE-FITC kit. Apoptotic cells were stained positive and were counted using fluorescence microscopy. Our data demonstrate a significantly higher frequency of apoptotic cells in untreated HUVEC (Fig. 3⇓) and HMEC (data not shown). 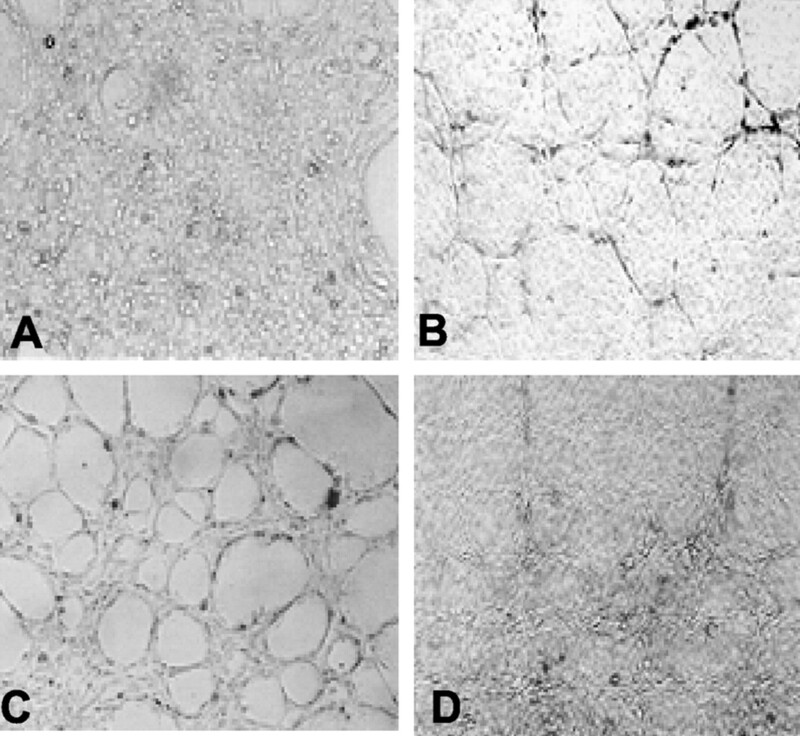 In contrast, the addition of IL-8 significantly inhibited the apoptosis of endothelial cells (Fig. 3⇓), suggesting that IL-8 inhibits apoptosis and functions as a survival factor for endothelial cells. Enhanced survival following IL-8 treatment in HUVEC. HUVEC were incubated with medium alone or medium containing different concentrations of IL-8 for 72 h. Cells were stained with a CaspACE FITC-valylalanyaspartyl[O-methyl]fluoromethoxyketone in situ marker kit (Promega) according to the manufacturer’s protocol and apoptotic cells were examined by fluorescent microscopy. A, Endothelial cells incubated with medium alone. B, Endothelial cells incubated with 10 ng/ml IL-8. C, The frequency of CaspACE-positive endothelial cells in IL-8-treated and untreated cultures were determined by counting five fields (×200) for each treatment. The values are mean percent apoptotic cells ± SEM. This is representative of two experiments done in duplicate. Total RNA was isolated from endothelial cells treated with medium alone or medium containing IL-8 and mRNA expression of pro- and antiapoptotic genes was detected by RT-PCR (Fig. 4⇓). We observed no increase in survinin mRNA expression between untreated and IL-8-treated HUVEC (Fig. 4⇓). IL-8-treatment enhanced mRNA for antiapoptotic Bcl-xL (378 bp) and proapoptotic Bcl-xS (190 bp) genes (Fig. 4⇓A). Similarly, treatment of endothelial cells with IL-8 also enhanced Bcl-2 mRNA expression and down-regulated Bax mRNA expression (Fig. 4⇓B). However, the increase in Bcl-xL expression was much higher than in Bcl-xS, leading to an elevated ratio of Bcl-xL: to Bcl-xS (Fig. 4⇓). Similar to mRNA data, our Western blot analysis demonstrates that IL-8 treatment up-regulated Bcl-2 (antiapoptotic) protein and decreased Bax (proapoptotic) protein productions in a concentration-dependent manner (Fig. 4⇓C). These results suggest that IL-8 promoted endothelial cell survival by enhancing expression of antiapoptotic survival-associated genes in endothelial cells. A, Expression of apoptosis-associated genes in IL-8-treated endothelial cells. Isolated total RNA from untreated and IL-8-treated HUVEC were analyzed by semiquantitative RT-PCR. Expression index was calculated by comparing the levels of specific mRNA transcripts with the housekeeping gene GAPDH. The values shown are fold increase/decrease in mRNA levels compared with untreated controls. B, The ratios between Bcl-2 and Bax and Bcl-xL and Bcl-xS are calculated to determine the mRNA expression profile of proapoptotic and antiapoptotic genes in HUVEC treated with medium alone or medium containing different concentrations of IL-8. C, Expression of pro- and antiapoptotic proteins following treatment with IL-8 as determined by Western blot analysis. We examined MMP-2 and MMP-9 mRNA and activity in endothelial cells cultured in medium (phenol free, serum-free RPMI 1640) alone or medium containing different concentrations of IL-8. 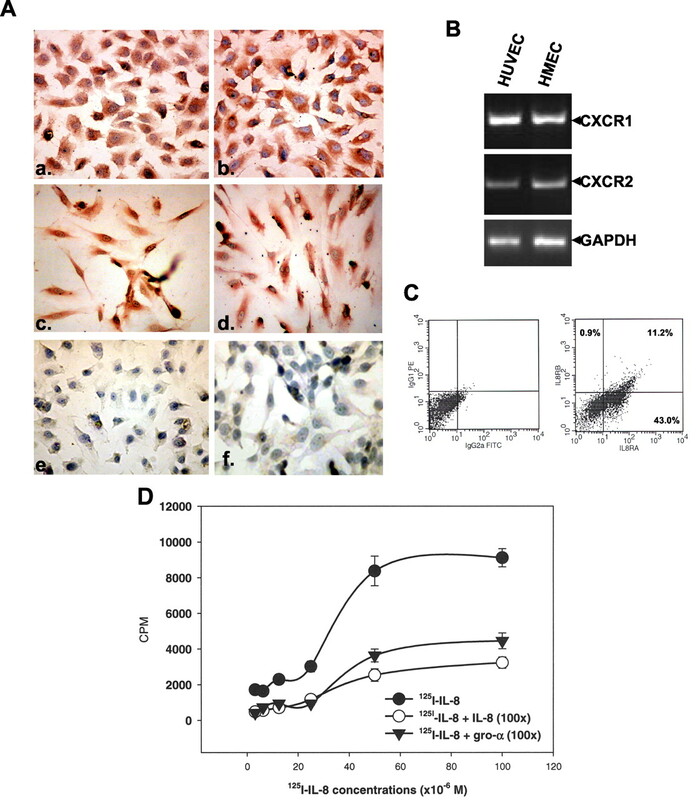 MMP-2 and MMP-9 mRNA expression was increased in cells treated with 10 and 100 ng/ml IL-8 (Fig. 5⇓A). 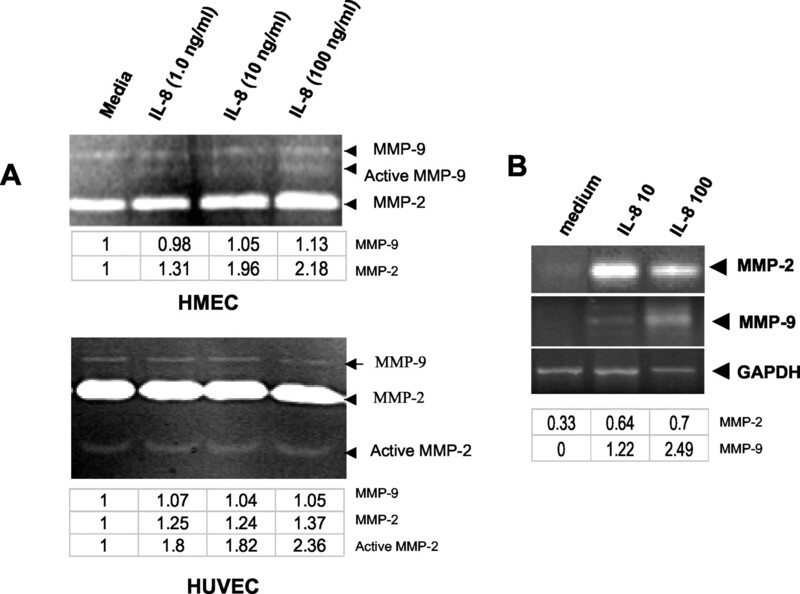 Culture supernatant collected from endothelial cells treated with medium containing IL-8 showed higher levels of active MMP-2 and MMP-9 production (Fig. 5⇓B). Regulation of MMP-2 and MMP-9 expression in IL-8-treated endothelial cells. A, Supernatants were collected from untreated and IL-8-treated HUVEC. MMP-2 and MMP-9 activity in the culture supernatants was determined by zymogram. The zymogram was scanned using a PhosphorImager and the intensity of bands was quantitated using ImageQuant software (Molecular Dynamics). The values, shown in the lower boxes under the zymogram represent the fold increase in MMP activity as compared with endothelial cells treated with medium alone. This is a representative experiment of three. B, MMP-2 and MMP-9 mRNA expression was analyzed using RT-PCR. Expression index was calculated by comparing the levels of specific mRNA transcripts with the housekeeping gene GAPDH. The values shown in the lower boxes are expression indices for each treatment. Earlier studies have demonstrated that IL-8 is a chemotactic factor for endothelial cells (5). We examined the effect of IL-8 on CXCR1- and CXCR2-expressing endothelial cell migration. We observed a concentration-dependent, significantly enhanced migration of endothelial cells incubated with IL-8 as compared to cells incubated with medium alone (Fig. 6⇓). Migration of endothelial cells in response to IL-8. Migration of endothelial in response to IL-8 was examined using modified transwell chambers. The values are percentages of migrated cells ± SEM. This is a representative experiment of three, with similar results. Next, we examined the effect of IL-8 on endothelial cell organization into capillary tube structures. Endothelial cells were plated on a Matrigel-coated 24-well plate with medium alone or medium containing IL-8 (10 ng/ml), FGF-2 (10 ng/ml), or IL-8 (10 ng/ml) with neutralizing Ab to IL-8 (10 μg/ml). After 6 h of incubation, plates were examined for capillary tube formation under an inverted microscope. We observed increased capillary tube formation in endothelial cells incubated with medium containing IL-8 and FGF-2 (Fig. 7⇓). 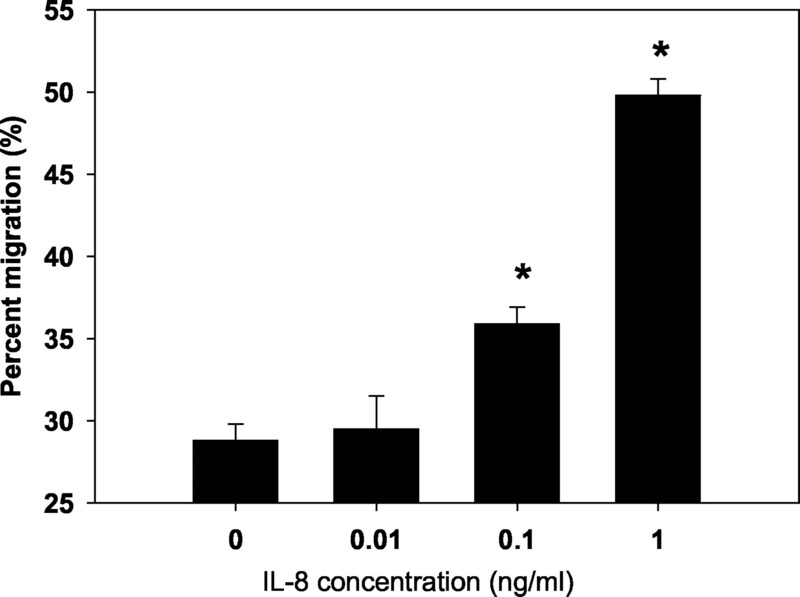 In addition, cultures treated with both IL-8 and neutralizing Ab to IL-8 demonstrated reduced capillary tube formation compared with cells incubated with medium alone or with IL-8 alone (Fig. 7⇓), suggesting the specificity and direct effect of IL-8 in mediating endothelial cell capillary tube formation. Effect of IL-8 on HUVEC capillary tube formation. 5 × 104 HUVEC were plated on a Matrigel-coated 24-well plate with medium alone or medium containing IL-8, FGF-2, or Ab to IL-8. After 6 h of incubation, plates were examined for capillary tube formation by microscopy. Treatment of HUVEC with: A, cells incubated with medium alone; B, cells incubated with 10 ng/ml FGF-2; C, cells incubated with 10 ng/ml IL-8; and D, cells incubated with 10 ng/ml IL-8 with anti-IL-8 Ab (10 ng/ml). Each assay was done in duplicate. This is representative of three experiments. The angiogenic property of IL-8 and related CXC chemokines has been known for several years (5). It has been shown recently that CXCR2 is the putative receptor involved in mediating ELR+ CXC chemokine-mediated angiogenic activity (31), which has, however, not been shown conclusively. Although earlier data clearly demonstrate that IL-8 is a chemotactic and growth factor for endothelial cells, there have been difficulties in detecting IL-8 receptors on endothelial cells. In this study, we report that both HUVEC and HMEC constitutively express CXCR1 and CXCR2 mRNA and protein. Earlier reports suggest that IL-8 receptors are lost in culture, a concept that only recently has been contradicted by recent reports (32). Murdoch et al. (7) showed expression of both CXCR1 and CXCR2 on HUVEC. These cells responded differently for chemotaxis and induction of calcium mobilization to IL-8 and stromal cell-derived factor 1 (7). Salcedo et al. (33) demonstrated differential expression and responsiveness of CXCR1 and CXCR2 by HMEC and HUVEC. This was the first indication that IL-8 receptors exist on endothelial cells in vitro and that they evoke behaviors that differ from those observed in leukocytes. We extend these studies to show that HUVEC and HMEC express CXCR1 and CXCR2 mRNA and protein. Schraufstatter et al. (34) showed that lung microvascular endothelial cells express CXCR1 and CXCR2 and IL-8 activates Rho and Rac signaling pathways through these receptors. IL-8 is widely expressed in tumor, stroma, and endothelial cells (9, 10, 11, 12, 13). Its autocrine and paracrine function has been shown to play an important role in angiogenesis (5, 6, 7, 8, 11), tumor growth, and metastasis (12, 35, 36). However, the direct role of IL-8 in angiogenesis remains unclear. We observed that IL-8 stimulates endothelial cell proliferation and capillary tube organization in a concentration-dependent manner, which can be blocked by neutralizing anti-IL-8 Abs, suggesting that IL-8 promotes angiogenesis by directly interacting with endothelial cells. Furthermore, our data suggest that endothelial cell proliferation, survival, expression of survival-associated genes and MMPs depend on the concentration of IL-8 used. Since angiogenesis is essential for tumor progression and metastasis (3, 4, 37), these data suggest that IL-8 plays an autocrine/paracrine role in tumor growth and metastasis (11). Endothelial cell survival and programmed cell death are critical for maintenance of vascular structure in angiogenesis (19). When HUVEC were cultured in medium devoid of growth factors, large numbers of endothelial cells were dead after 72 h in culture. However, adding IL-8 to these cultures significantly enhanced the survival of cultured HUVEC. In one of the earlier studies, Nor et al. (38) demonstrated that IL-8 did not inhibit the apoptosis of human dermal microvascular endothelial cells. The observed differences could be due to differences in the cell lines used in these studies. IL-8 has been implicated as a survival factor for endothelial cells and a key mediator of angiogenesis for several tumors, including carcinoma of lung, colon, oral cavity, Kaposi’s sarcoma, and melanoma (5, 10, 38, 39, 40, 41, 42, 43, 44). The mechanism by which IL-8 exerts its antiapoptotic effect is not clear. Earlier studies suggest that IL-8-mediated inhibition of apoptosis could be dependent or independent of Bcl-2 expression (38, 45, 46). Differential expression of Bcl-2 family members, which includes antiapoptotic (Bcl-2 and Bcl-xL) and proapoptotic (Bax and Bcl-xS) genes, regulates apoptosis (22). Bcl-xL and Bcl-xS are splice variants of the Bcl-x gene (47). 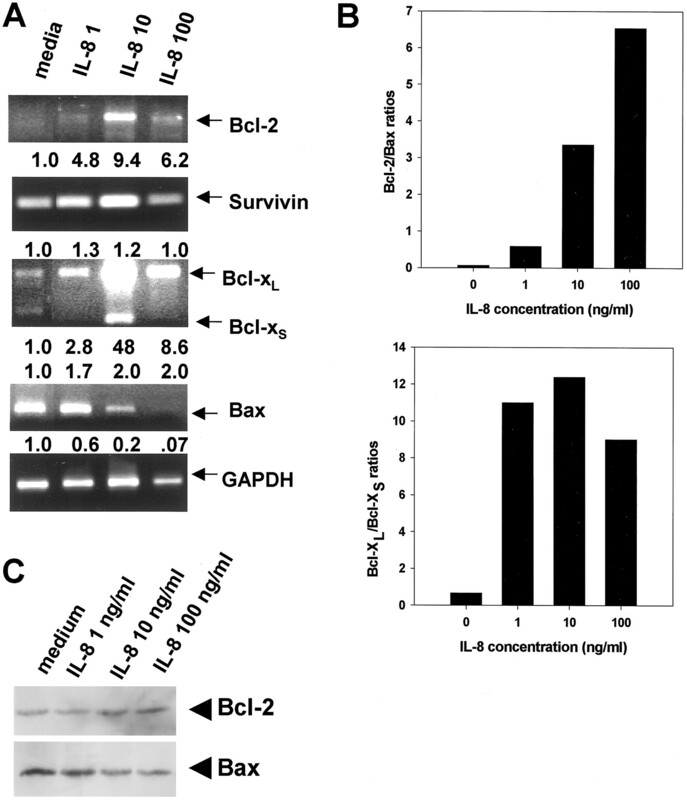 The Bcl-2 and Bcl-xL genes interact with Bax to suppress apoptosis, while Bcl-xS promotes cell death by inhibiting Bcl-2 and Bcl-xL (22). Constitutive expression of Bcl-x has been shown in HUVEC as reported by Ackermann et al. (48). The enhanced Bcl-xL expression levels coupled with increased Bcl-xS expression levels were observed in IL-8-treated HUVEC. IL-8 also induced increased Bcl-2 and decreased Bax expression in endothelial cells, tilting the balance in favor of an antiapoptotic effect of IL-8. Although there was increased Bcl-xS gene expression in IL-8-treated HUVEC, we observed an increased ratio of Bcl-xL:Bcl-xS following treatment with recombinant human IL-8. The ratio of Bcl-2:Bax and Bcl-xL:Bcl-xS can reflect enhanced endothelial cell survival (49). A recent report demonstrates the association between Bcl-2 expression and IL-8 production and their interdependence in angiogenesis in vivo (38). These data suggest that IL-8 might regulate angiogenesis by modulating the endothelial cell antiapoptosis pathway. Tumor angiogenesis is a complex process that is regulated by a balance between angiogenic and antiangiogenic factors (18, 50), which are influenced by the tumor cell itself and/or the tumor microenvironment (18). Degradation of the extracellular matrix by MMPs is required in endothelial cell migration, organization, and, hence, angiogenesis (17, 18). Recent reports suggest that IL-8 up-regulates MMP-2 expression in human melanoma cells (51). In the present study, the mRNA levels, as well as active MMP-2 and MMP-9 expression in endothelial cells, were enhanced by recombinant human IL-8, suggesting that IL-8 is involved in the degradation of extracellular matrix, leading to endothelial cell migration, invasion, and capillary tube organization. In conclusion, IL-8 may be a potential endothelial cell growth and survival factor, interacting through its receptors expressed by endothelial cells. The mechanism of IL-8 regulation of angiogenesis may be in part due to enhanced proliferation and survival of endothelial cells by differential expression of antiapoptosis genes and in part by activation of MMP-2 and MMP-9. The development of strategies to block IL-8 production and/or activity may hold promise in limiting the deleterious effects of IL-8-mediated angiogenesis in various disease states, including malignant tumors. We thank Richard Murcek for his secretarial assistance and Lisa Chudomelka for her editorial assistance. We thank Dr. Maneesh Jain for 125I-IL-8 labeling and Dr. Charles A. Kuszynsky for expert help in flow cytometric analysis. ↵1 This study was supported in part by Grant CA72781 from the National Cancer Institute, National Institutes of Health. ↵3 Abbreviations used in this paper: MMP, matrix metalloproteinase; HMEC, human dermal microvascular endothelial cell; ICC, immunocytochemistry; FGF-2, fibroblast growth factor 2; gro-α, growth-regulated oncogene. Fidler, I. J., L. M. Ellis. 1994. The implications of angiogenesis for the biology and therapy of cancer metastasis. Cell 79: 185-188.